Hope you're finishing up the year with hope in your heart and surrounded by loving family and friends. That's what I'm doing this year, but I sure had to do some power-traveling to make it happen. I'm in Zimbabwe (!) where my son's wife has a job with USAID. Monique, my son Dan, and my grandson Sebastian have only been here for four months, but it seems like an eternity to me. Sebastian was almost one year old when they left, just learning to stand and take a few steps. Now he's running, pitching, kicking soccer balls ... he knows about 40 signs in baby sign language, which makes it possible for him to communicate pretty effectively. My son says speech is often delayed in households where children are learning several languages. Sebastian is learning English, Spanish and Shona - besides his sign language skils. I'm afraid I didn't have a vivid enough imagination to dream about doing anything like this when I was a child, so I can't say it's a dream come true... I guess it's proof that you never know where life might take you - so don't give up or give in - amazing, extraordinary things could be right around the corner. 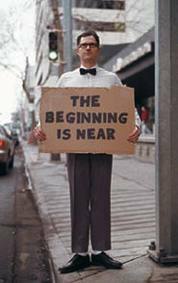 For example, I'm thrilled that the 'Occupy' movement has achieved so much. It's wonderful to hear people talking about the 1% and going after the big banks. The dialog seems to have shifted somewhat in the US - and not a moment too soon. Your generosity and kindness since cancer threw me out of work in August of 2010 have made this past year one of the most wonderful of my life. I'm really defying the odds for now. Both of my dear friends Jack Hardy and Tim Henderson were diagnosed with small cell lung cancer after I was, and both are dead. It would be easy to get depressed with odds like mine. I cannot thank you enough for your support and love. You've enabled me to visit family and friends, to pay fairly substantial insurance premiums, copays and deductibles, to pursue holistic treatments that greatly enhanced my quality of life, and to continue living my life as much as possible as if I were still working - including leaving me able to continue supporting organizations (at a slightly lower level than before) that mean so much to me - Health Care NOW!, Democracy NOW!, SOAW, Labor Campaign for Single Payer, US Labor Against the War, NOW, the Fund for the Feminist Majority and many others. Nothing would depress me more than being unable to support locked out and striking workers, and the organizations that do so much to promote social and economic justice. If you're still holding on to any extra money, please think about sending some to any of those wonderful organizations, or to the locked out workers at American Crystal Sugar. I hope you'll continue to buy my recordings at CDBaby http://cdbaby.com/all/unionmaid - It means so much to me. 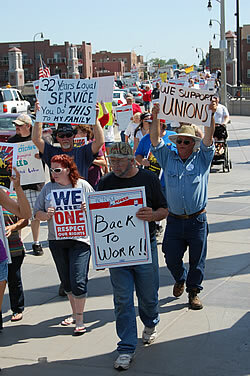 And "The Corporate Welfare Song," "War on the Workers" and "Have You Been to Jail for Justice?" 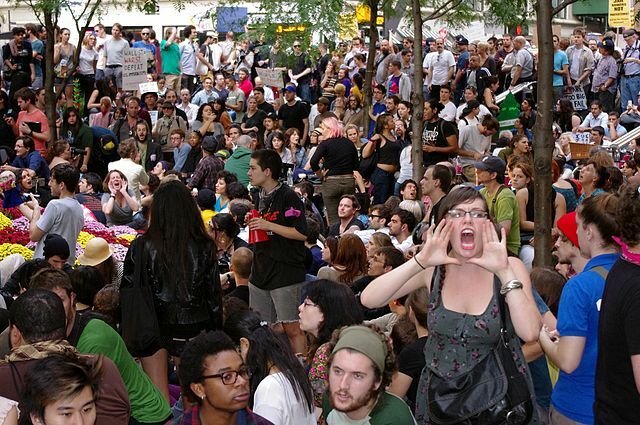 are all great songs to take to your favorite OCCUPY site! I will be at the Peoples Music Network Winter Gathering January 27-29th in Lawrence, MA. We'll be celebrating the great working class victory in the Bread and Roses Strike of 1912. Bev Grant, Evan Greer, Charlie King, Spirit Child, Rebel Voices, Jon Fromer and many other fabulous performers and agitators will be on hand for the weekend that starts with a terrific Friday night concert. You don't have to be registered for the weekend to come to the Friday night concert, but you'll love the weekend if you stick around. You don't have to be a performer to attend - just a music lover. The internet is so slow here in Harare that I don't dare try to upload photos or any extra links in this newsletter. I hope you get it... and I look forward to hearing from you. Let's hope that 2012 brings us great victories for the working class ... that we begin to look around and realize that WE are the leaders we've been waiting for. Let us cherish our friends and be grateful for all that they bring to our lives. I love it when you write back. 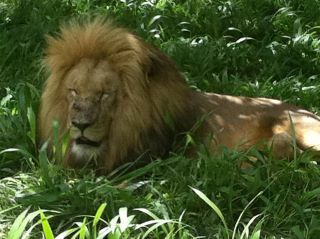 Please understand that right now my energy level is so low that I may not respond... but I usually respond! The last time I wrote to you was October 1st... If I had let November slip away without writing to you, it would have been the first time I missed a month in 91 months! But, I have never been so exhausted in my life. I'm working with an endocrinologist to figure out how to wake up my sleeping adrenal system. In the meantime, I'm a bald version of Sleeping Beauty. Please, don't shop at Amazon this year. You may have already seen some of the horror stories emanating from the Amazon warehouse in Breinigsville, PA. It's not a very good place to work. For example, during summer heat waves, Amazon arranged to have paramedics parked in ambulances outside, ready to treat the many workers who dehydrated or suffered other forms of heat stress. Those who couldn’t quickly cool off and return to work were sent home or taken out in stretchers and wheelchairs and transported to area hospitals. And new applicants were ready to begin work at any time. So... If you're buying books this holiday season, let me enthusiastically recommend Powell's books in Portland. They have an inventory to rival Amazon's *and* the workers are happy members of the ILWU - a great union. Use this link http://www.ilwulocal5.com/shop-union/ to shop at the world's best union bookstore! And if you're buying music, let me recommend http://cdbaby.com - They have a great collection of music and you can rest assured that you, the artists, and their employees will treated very well. 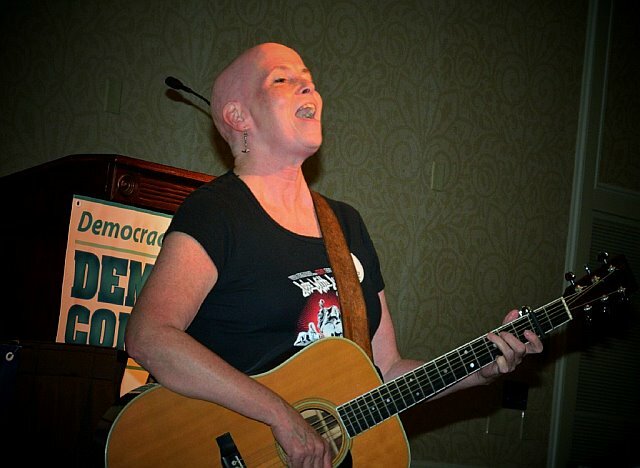 And my music makes a great gift for the activists in your life! - the direct link to my music there is http://cdbaby.com/all/unionmaid - and Roy Zimmerman(http://royzimmerman.com) , Chris Chandler (http://chrischandler.org), Four Shillings Short (http://4shillingsshort.com), Lou and Peter Berryman (http://louandpeter.com) and Evan Greer (http://evangreer.org) all have new releases. The amazing Bev Grant is working on a new CD.. http://bevgrant.com/ and there are sooooo many other great artists out there - Charlie King and Karen Brandow, Rebel Voices, David Rovics, Si Kahn, John McCutcheon, Kim and Reggie Harris, Magpie, Dan Bern, Anais Mitchell, Nick Annis, Brian QTN, Laura Love, Joey Only, Jan Hammarlund, Emma's Revolution, Len Wallace, Connie Cohen, Jim Page, Joe Jencks, Peggy Seeger, Tom Paxton, Utah Phillips and don't stop there! And see how much of your spending you can keep in your own community - supporting local artisans, massage therapists, restaurants... why not give your friends gift certificates to local merchants, locally owned health clubs ... or make a contribution to a local charity. I spent a month in Sweden with my wonderful husband, although I slept through most of it because of this adrenal dysfunction I'm dealing with. He was so thoughtful and wonderful - and we did squeeze in a visit with Julie's daughter Sara and new baby Levi! My cousin Bill and I traveled from Pittsburgh to New Orleans for the wedding of my cousin Christina Mumphrey to Michael Schafer - It was totally grand with many many of my cousins from near and far in attendance. Both of my kids have been spending time in Pittsburgh caring for their dad, Ron Berlin, who underwent a sextuple bypass just before Thanksgiving. I'm pleased to report that he is at home and recovering well under Amy's loving care. 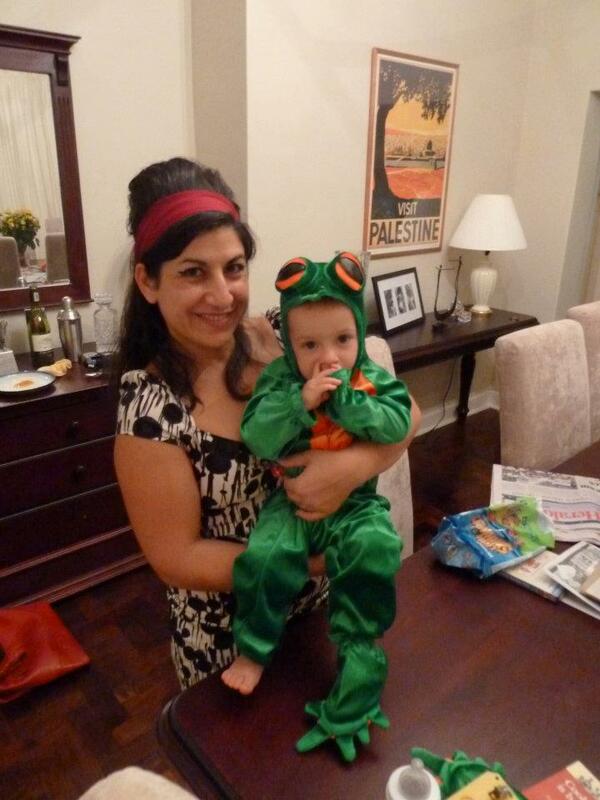 Halloween - with Monique as Amy Winehouse and Sebastian the Frog! 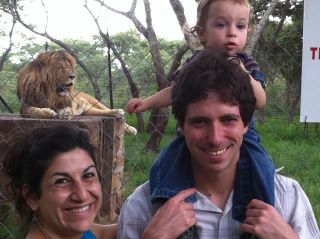 Daniel is back in Zimbabwe now, waiting for us to come and celebrate the holidays with him, Monique and, of course, Sebastian! I can't wait to see them again. My sister and I leave on November 30th... and I won't be back in the US until January 20th. Amy and her very significant other, Mike Meadows, will be joining us in Zimbabwe too. On New Year's Eve we plan to be in lodges in Hwange National Park and on to Victoria Falls! “Do I refocus and put my energy into exposing the on-going crime of medical negligence in these jails? Do I begin a campaign to highlight the illegal starvation diet in the Blount County jail, for which no one has been arrested? Do I join the effort to condemn the practice of overcharging mostly dirt poor inmates for phone calls, and commissary, so that corporations and counties receive greater kickbacks? This quote is from a good friend of ours, Bonnie Urfer, who works at NukeWatch in Luck WI. As I listened to all the media pundits declaring that the Occupy Movement is unfocused and has no demands ... I came across this manifesto - I think it's very inspiring - and i think, accurate too. Something to wish for this holiday season. As the days get shorter, and the darkness appears to be taking over, it's my wish for all of us. that you are important, that your dreams are real, that your needs will be met, that your burdens are shared, that your wellbeing is paramount, and that you are loved. Affirmed by deeds, to be enacted voluntarily by the people individually and in concert as a living declaration. And hope to see you at the People's Music Network Winter Gathering in Lawrence, MA - January 27-29, 2012 - Celebrating the 100th Anniversary of the "Bread and Roses" strike!! Now as the weather changes, and the harvest peaks, instead of negotiating ACS is spending millions on goonie security and imported scabs. And production is waaaaaaaaaay down. It looks like management has forgotten how the beets are processed into beet sugar, as they just can't seem to tell the scabs what they should be doing. The results have been fires, accidents and injuries. It's a huge source of frustration and occasional amusement to the loyal workers to watch the plant being trashed by incompetents. If you have friends in South Dakota, Montana or Minnesota, PLEASE let them know that Evan and I are out and about and would love to see them at our shows! Evan Greer and Anne Feeney in SD! 157 1/2 E. Main North St.
Anne Feeney and Evan Greer in Bozeman! Details TBA! Come out to The Filling Station for some High Energy radical music! Please spread the word! 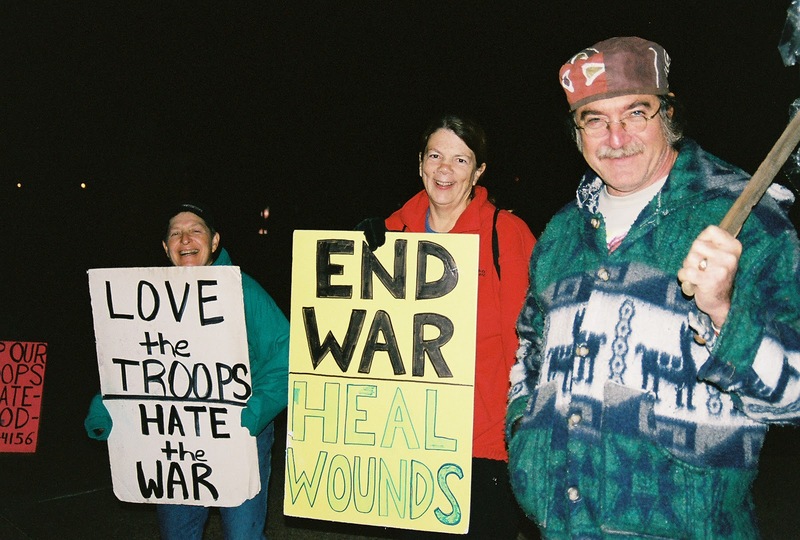 From March 2005 until last night, my friend and comrade Bruce Wolf has organized a Friday night vigil outside Walter Reed Hospital in Washington, DC. The vigil calls for an immediate end to the wars, return of the troops, funding for veterans' health and needs. For six and half years two-dozen to 200 people have gathered outside the hospital with signs, singing and chanting. They never missed a single Friday. An amazing show of fidelity and devotion. 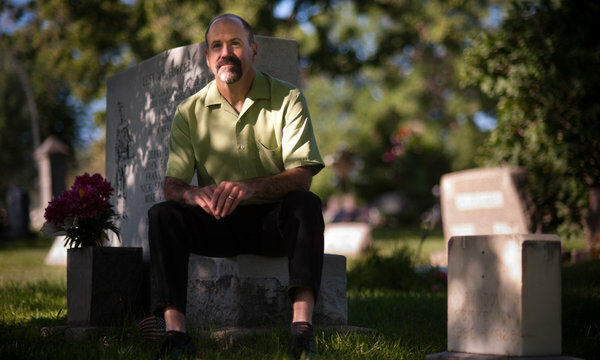 The hospital is closing, and so the vigils come to an end. Unfortunately, the wars drag on. I still congratulate Bruce and marvel at this fantastic achievement. Assuming I get the all-clear on the 13th, I'm going to go visit my husband in Sweden on October 15th... We're meeting in Copenhagen, where we went on our honeymoon, and visiting friends in Denmark and Sweden. I'll be there for his birthday on November 12th and then head back to the US for a wonderful family wedding in New Orleans. 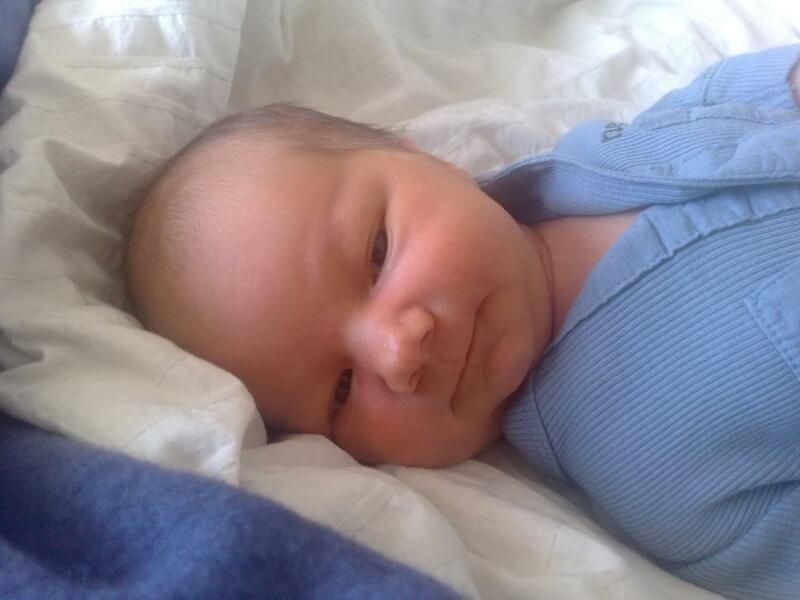 I'll get to meet Julie's new grandson, Levi while I'm in Sweden! YAY! Today in St Augustine people are celebrating the life and work of my dear friend Stetson Kennedy, who died on August 27th and will be sorely missed by all who had the opportunity to know him. There's much more to tell, but no time to tell it. Heads Up Pittsburgh! Big fun on Saturday, September 10th! Come to the Pump House in the Homestead Waterfront on Saturday, September 10th at 1:30PM to meet someone very special, sing some Joe Hill songs with me, and buy a wonderful book! There was a great article about Bill and his book in the NY Times last Sunday. He's making a little history of his own here, as I think he'll be known as the guy who found the evidence that exonerates Joe Hill. You won't want to miss this very special event. I'll lead a few Joe Hill songs, and Bill will talk about the book, and gladly sign your copy! Cash, checks and credit cards all welcome. Need more information? Call me: 412-877-6480!